When Dr. Stanislaw Burzynski began searching in the 1960s for factors that would stop cancer, he had no idea he would discover one of the twenty-first century's most exciting anticancer treatments. He also had no idea it would take 40 years of his life to isolate a few peptides from the human body. Peptides are derived from two or more amine acids by combination of the amine group of one acid with the carboxyl group of another, and are usually obtained by partial hydrolysis of proteins. These chains of amine acid residues have remarkable biological functions ranging from hormonal regulation to antibiotic activities. Medical practitioners in ancient Egypt, Greece, India, and Rome predicted the existence of what are now called peptides. These ancient healers believed healthy people had substances in their bodies that could be taken out and put into sick people to cure them. These mysterious factors are among other phenomena that have been demonstrated but not identified for eons. We now know some of these substances by names like antibodies, cytokines (produced by immune cells), and vitamins. These factors maintain organ function and curtail threats such as bacteria, but it is reasonable to suspect that the human body manufactures other compounds that might target cancer. In the late 1800s, the Polish researcher Stanislaus Bondzynski discovered natural "bioactive peptides" in the body, but did not realize that they could stop the growth of cancer. Although published in scientific journals of the time, his findings were ignored by all but a few. Today, however, bioactive peptides are a big-ticket item for drug companies searching for new sources of profits. Peptides such as insulin and growth hormone have changed the face of medicine. Others who followed Bondzynski confirmed and expanded on his work, including Dr. Burzynski. In 1968, Dr. Burzynski reported on the first group of what would eventually become "antineoplastons" — natural anticancer agents found in the blood of healthy people but mysteriously absent in the blood of people with cancer. Antineoplastons were different from Bondzynski's peptides and those isolated by others. Subsequent research found that Dr. Burzynski's antineoplastons could be divided into two groups: those with broad-spectrum activity against cancer, and those with effects against certain types of cancer. Dr. Burzynski continued to refine and test the factors throughout the 1970s. Finally, it was proven beyond a doubt that the factors did in fact stop cancer growth, both in vitro and in vivo. But Dr. Burzynski was unable to determine exactly how they worked. Meanwhile, another medical researcher, Dr. Ming Liau, had been investigating abnormalities in cancer cells that allow them to keep multiplying. Dr. Liau discovered that cancer cells have abnormal versions of enzymes involved in cell growth. These enzymes relate to "methylation," a simple biochemical reaction with enormous implications for cancer patients because of its relationship to cancer cell growth. Dr. Liau discovered that methylation-related enzymes in cancer cells switch the reaction into permanent "overdrive" so that cancer cells constantly replicate. Dr. Liau joined Dr. Burzynski's group and began testing whether antineoplastons could affect this process. He discovered that some antineoplastons stop runaway cell growth and cause the cells to revert to normal behavior. This ability of cancer cells to "normalize" is an exciting phenomenon in cancer research. Only a few things are known to provoke it, including vitamin A derivatives, hormones, vitamin D3, and emodin (found in grape vines and other plants). As with Bondzynski's bioactive peptides, however, it would be decades before anyone understood the important connection between what Dr. Liau was studying — abnormal methylation enzymes — and cancer. In the early 1990s, the connection was finally made, and today methylation is one of the most challenging areas of cancer research. The National Cancer Institute lists methylation-related research as a main priority under its new initiatives. But when Dr. Liau made his discovery, no one understood the importance of methylation to cancer and its treatment. Dr. Burzynski continued to isolate antineoplastons from healthy people and synthesize them for use in people with cancer. He knew that cancer patients actually have the factors but for some reason excrete them, and that if patients stopped excreting the factors when treated with antineoplastons, they would likely respond to treatment. Above all, Dr. Burzynski knew that the factors work with very little toxicity, selectively targeting cancer cells while leaving healthy cells alone. Aside from knowing that some antineoplastons affect methylation enzymes, however, Dr. Burzynski still was not sure how they worked. Nevertheless, he noted that one antineoplaston attaches to DNA like some types of cancer drugs, while another was structurally related to phenylbutyrate, a natural fatty acid that can stop cancer through a process known as "acetylation." Acetylation is similar to methylation in its ability to control the activation and deactivation of genes, which is critical to the study of cancer. Today, acetylation is a hot topic in both cancer and longevity research. To date, Dr. Burzynski has isolated and synthesized 20 different antineoplastons from humans and several others from animals. His "third generation" of antineoplastons has 1,000 times more activity than the first ones he isolated, allowing fewer to be given but with much greater effect. While Dr. Burzynski continues to look for new anticancer factors, finding them is slow, painstaking work, and many such factors may be needed for each type of cancer. Hundreds of antineoplastons may wait undiscovered. Finding, isolating, and synthesizing each one may take a long time. Yet, as the mysterious workings of antineoplastons continue to be revealed, Dr. Burzynski plunges forward with the enthusiasm of a young student on the brink of a great discovery. Life Extension caught up with Dr. Burzynski at his clinic in Houston, where he specializes in treating glioma, a form of brain cancer. LE: You're very excited about some new research that's coming out. Tell us about it. Burzynski: We are about to learn the results of a DNA microarray we did to see what one of the antineoplastons does to 3,000 genes of glioblastoma brain tumor cells. LE: What is a microarray? Burzynski: Essentially, it's a test that enables us to take a close look at a lot of genes in a short period of time. LE: Why is this important? Burzynski: By looking at the DNA of the cancer cell, we can see which genes are abnormal, and how antineoplaston treatment may reverse these abnormalities. LE: Give us an example of what you're looking for. Burzynski: In about 30-40% of all cancers, an oncogene, or cancer gene, known as "ras" is activated. When activated, ras allows a protein to stick to the cell and send an abnormal signal. If we can deactivate ras, we can slow down cancer. The microarray will tell us which antineoplastons can shut this gene down. LE: Why is ras activated in cancer cells but not in normal cells? Burzynski: Abnormal methylation or mutation of the ras gene causes abnormal activation. If we can normalize methylation or inhibit protein produced by the gene, we can deactivate the gene and interfere with cancer's ability to replicate and spread. LE: Can antineoplastons normalize DNA methylation? Burzynski: Yes. Antineoplastons normalize. DNA methylation and deactivate ras oncogene protein, making a gene behave normally. LE: Does the treatment affect normal cells? Burzynski: No, this is why antineoplastons are a nontoxic treatment. They affect only abnormal cells. Another example of the ras gene being abnormally activated is the "elephant man" (John Merrick). The abnormal growths on his head and body were probably benign tumors caused by a defect in the gene that inhibits ras. In effect, the elephant man may have been suffering from methylation abnormalities, among other things. LE: The most hopeful and exciting thing about methylation research as it relates to cancer is that abnormal methylation can be reversed — it can be made normal again — which means that nonfunctional genes can be made to function again. LE: We talked about cancer genes. What about "tumor suppressor genes"? How do they relate to cancer? Burzynski: Tumor suppressor genes normally cause proteins to be made that provoke apoptosis — a process that naturally destroys cancer cells. This goes on all the time in healthy tissue. In cancer cells, tumor suppressor genes are shut down; they don't work. The idea is to reactivate them. LE: The p53 gene is an important tumor suppressor gene, isn't it? Burzynski: Yes, and it is of great interest to us because it's not working in about 70% of white Americans with brain tumors. In Japanese patients, it doesn't work in 50 – 60%. One of the antineoplastons reactivates p53. LE: What causes the gene to shut down? Burzynski: First, abnormal methylation and mutation of the gene itself, and antineoplastons reverse this. Also, three important enzymes relate to how cancer cells multiply. All three involve methylation. We've discovered that in normal cells, the enzymes stick together briefly, and then come apart. In cancer cells, they stick together and make the cells keep replicating. It's as though a switch is stuck in the "on" position. At least three of our antineoplastons make the enzymes disassociate. When the enzymes are normalized, the cancer cells undergo apoptosis, or cell death. LE: So some antineoplastons appear to be able to restore the normal function of important genes without toxicity? Burzynski: Yes, from what we know so far. The 3,000-gene microarray that we've just done is going to give us more information in this regard. LE: As if methylation and cancer weren't complicated enough, your latest publication concerns some new research on DNA structures known as histones and their role in cancer. Burzynski: Yes, this also has to do with normalizing the behavior of cancer cells. "Histone deacetylase inhibitors" are a new class of drugs being tested for cancer. Some of the antineoplastons are natural histone deacetylase inhibitors. Acetylation is a process related to methylation. Both affect how genes behave. One affects the other, so it's important to address both processes. When cancer cells are treated with drugs that modulate both, you get a better response. LE: We understand that four antineoplastons are undergoing clinical trials under FDA supervision for a variety of cancers, including brain stem glioma, childhood cerebral astrocytoma, malignant lymphoma, colon cancer, melanoma, prostate cancer, breast cancer, and others. Burzynski: There are 76 studies in all. LE: Brain cancer is your special interest, but do you treat other types of cancer? LE: When you administer the antineoplastons, the patient wears a pump that constantly delivers the treatment. Why is it done this way? Burzynski: The treatment has to be given gradually because the cancer cells are dying. There is something called "tumor lysis syndrome," where the patient can get sick from the dying cells. We've found that if the treatment is given over a period of two to eight months, the tumor disappears more quickly and safely. LE: Are the antineoplastons made synthetically? In other words, once you isolate the natural substance from the body, you then create it in a laboratory? LE: Could antineoplastons possibly have other uses? Aging is another phenomenon that involves abnormal methylation. Could antineoplastons be used to reverse aging as well? Burzynski: Yes. We've noticed that people who get antineoplastons for cancer treatment receive other benefits as well — for example, they are resistant to common viral infections. Their blood cholesterol is normalized and they are less susceptible to breast cancer and enlargement of the prostate. Their skin is healthier, they are less depressed, and they have more energy. LE: One final question. If you were able to isolate and synthesize every antineoplaston made by the entire body, could you theoretically cure every type of cancer there is? Most cancer patients who receive antineoplaston therapy have failed conventional therapy. Many are in advanced stages of the disease and have undertaken other therapies, making it difficult to determine how well antineoplastons work compared to other treatments. The most dramatic results seen so far are in people with brain cancer. Glioblastoma multiforme is a type of brain cancer that responds poorly to standard therapy. With conventional treatment, survival time is six to nine months; untreated, the survival time is approximately four months. The percentage of people having a partial response to chemotherapy has been reported to be just under 5%. In a trial of 80 people who had recurrent or persistent tumors after conventional treatment and who were then treated with antineoplastons, 15 responded with a complete or partial response; 24 were stable, meaning they had a less-than-50% reduction in tumor with no progression; and 41 saw their disease progress. The median survival time was 15 months. Of those who responded, five have survived more than seven years, with two of the five surviving more than 10 years. Interestingly, in some cases, it appears that antineoplastons take over a year to show effects. In another study of people with high-grade glioma, antineoplastons produced a complete or partial response in 36%, stabilized the disease (less than 50% reduction in tumor size but no progression) in 35%, and resulted in no change (disease progression) in 29%. By comparison, a recent phase II study using thalidomide and a new FDA-approved chemotherapy drug called Temodar® produced a complete or partial response in 21% of the patients, stabilized the disease in 14%, and resulted in disease progression in 65%. The use of antineoplastons to treat breast cancer has not been as successful as hoped. Dr. Burzynski believes this is because the antineoplastons currently in use target the p53 tumor suppressor gene, a gene not frequently associated with this type of cancer. Using antineoplastons along with traditional therapy is an idea that has recently caught on. In a study published in Cancer Letters, researchers report that women with breast cancer excrete antineoplaston A-10 at high rates.2 This correlates with destruction of blood cells known as neutrophils. Antineoplaston A-10 reverses this trend and may be useful in restoring neutrophil levels and immunity in breast cancer patients. 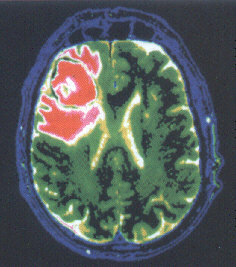 Abnormal MRI (Magnetic resonance imaging) scan of a brain showing glioblastoma, a malignant tumor formed by uncontrolled proliferation of glial cells. Glial cells, or neuroglia, are small nerve cells that support the central nervous system. Transverse cross section. For more information on Dr. Burzynski, his clinic, and his research, visit his website (www.cancermed.com). For information on cancer trials, including trials on antineoplastons, visit the National Institutes of Health website (http://clinicaltrials.gov).